Culex gelidus Theobald has emerged as a major vector of Japanese encephalitis virus (JEV) in India, Southeast Asian countries and Australia. The species has expanded its geographic distribution from the Indian subcontinent to Japan, China, other Southeast Asian countries, Island nations in Australasian region and Australia. In recent years, a sudden increase in its population especially in the urban and sub-urban areas has been observed in several countries, thus, becoming a dominant mosquito species. The virus has been repeatedly isolated from from different geographical locations making it one of the most important vectors of JEV. Apart from JEV, other viruses of public health importance, viz. Getah, Ross River (RRV), Sindbis and Tembusu have been isolated from the mosquito. Experimental studies have shown that the mosquito Cx. qelidus is highly competent to transmit West Nile, Kunjin and Murray valley encephalitis viruses with infection and transmission rates of >80 and >50%, respectively for each virus. The species is also found competent to transmit RRV, but at a lower rate. Experimental studies have shown that the species is susceptible to chikungunya, Chandipura and Chittoor (Batai) viruses. Development of resistance to DDT and malathion has also been detected in the species recently. The invasive nature, ability to breed both in fresh and dirty waters, development of resistance to insecticides, high anthropophily and its potential to transmit important human viruses pose an increased threat of viral encephalitis in India and Oriental region especially in the light of explosive increase in its population. Ticks, as vectors of several zoonotic diseases, are ranked second only to mosquitoes as vectors. The diseases spread by ticks are a major constraint to animal productivity while causing morbidity and mortality in both animals and humans. A number of tick species have been recognised since long as vectors of lethal pathogens, viz. Crimean-Congo haemorrhagic fever virus (CCHFV), Kyasanur forest disease virus (KFDV), Babesia spp, Theileria, Rickettsia conorii, Anaplasma marginale, etc. and the damages caused by them are well-recognised. There is a need to reassess the renewed threat posed by the tick vectors and to prioritize the tick control research programme. 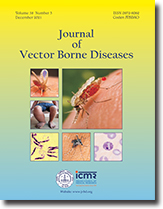 This review is focused on the major tick-borne human and animal diseases in India and the progress in vector control research with emphasis on acaricide resistance, tick vaccine and the development of potential phytoacaricides as an integral part of integrated tick control programme. Background & objectives: In the last decade, in the state of São Paulo, 5898 cases of cutaneous leishmaniasis (CL) were reported. This study was undertaken to analyze the epidemiology of CL in the municipality of Teodoro Sampaio, in São Paulo State, Brazil, based on a geographic approach, as very little is known of the relationship between CL and the spatial transformation process. Methods: This is a population-based quantitative, descriptive and cross-sectional case study. Surveys of the official notifications in the healthcare center and official sources from 1998 to 2011 were analysed. The data were described based on statistics and the Kernel method to detect hotspots of transmission. Results: The age group between 21 and 40 yr was most affected, with 24 cases (57.9%). Of the 41 cases reported between 1998 and 2011, 33 cases were having low education status and 31 cases (75.6%) were males. The spatial and temporal distribution was aggregated in three-year periods which permitted the identification of two microfoci, in periods I (1998-2000) and III (2005-2007). Interpretation & conclusion: The disease has presented, in recent years, a pattern of sporadic transmission or microfoci, and continues to maintain enzootic cycles of Leishmania in a sylvatic environment, ensuring the perpetuation of the pathogen in nature, and the risk of emergence of new cases of CL in domestic animals and humans. Background & objectives: Ranchi, the capital of Jharkhand state is endemic for malaria, particularly the Bundu Primary Health Centre (PHC) is the worst affected. Therefore, a study was initiated during 2009 using remote sensing (RS) and geographical information system (GIS) to identify risk factors responsible for high endemicity in this PHC. Methods: Bundu and Angara in Ranchi district were identified as high and low malaria endemic PHCs based on epidemiological data of three years (2007-09). The habitation, streams, other water body, landform, PHC and village boundary thematic maps were prepared using IRS-P6/LISS III-IV imageries and macro level breeding sites were identified. Digital elevation model (DEM) of the PHCs was generated using Cartosat Stereo Pair images and from DEM, slope map was derived to calculate flat area. From slope, aspect map was derived to indicate direction of water flow. Length of perennial streams, area under rocky terrain and buffer zones of 250, 500 and 750 m were constructed around streams. High resolution remote sensing imageries were used to identify micro level breeding sites. Based on macro-micro breeding sites, six villages from each PHC were selected randomly having combination of different parameters representing all ecotypes. Entomological data were collected during 2010-11 in pre- and post-monsoon seasons following standard techniques and analyzed statistically. Differential analysis was attempted to comprehend socioeconomic and other determinants associated with malaria transmission. Results: The study identified eight risk factors responsible for higher malaria endemicity in Bundu in comparison to Angara PHC based on ecological, entomological, socioeconomic and other local parameters. Conclusion: Focused interventions in integrated vector management (IVM) mode are required to be carried out in the district for better management and control of disease. Background & objectives: Resistance against partner drugs of artemisinin has been reported from different parts of India. The study aims to find out the single nucleotide polymorphisms in Plasmodium falciparum ATPase6 gene associated with artemisinin resistance. Methods: Blood samples were collected from 141 patients with P. falciparum monoinfection in malaria endemic zones of Assam and Arunachal Pradesh. A 645 bp portion of PfATPase6 gene was amplified and sequenced to determine the frequency of mutations associated with resistance to artemisinin. Results: Mutations at codon S769N, which have been proposed to confer artemisinin resistance, were not detected in our study samples. Instead of that a novel non-synonymous mutation (C-T) at 1847 bp position resulting in serine to phenylalanine alteration at codon S616F was detected from the P. falciparum field isolates in Changlang district of Arunachal Pradesh, whereas no mutation was detected in any of the analyzed samples in Assam indicating that wild type PfATPase6 genotype was found circulating in this region. Overall, based on the mutational pattern, two haplotypes of PfATPase6 gene were observed during the study, the wild type and mutant S616F allele. The overall haplotype diversity (Hd) was found to be: 0.069 and nucleotide diversity (per site Pi): 0.00012. Highest haplotype diversity was recorded in Changlang district of Arunachal Pradesh having Hd value of 0.33333 along with single polymorphic site and nucleotide diversity (Pi): 0.00060. A pair-wise fixation index (FST) value of 0.16667 indicates great genetic differentiation within the parasite population of Changlang district with the population of Karbi Anglong, Chirang, Tinsukia, Sivasagar, Jorhat, NC Hills, Lakhimpur, Golaghat and Dibrugarh districts of Assam and Lohit district of Arunachal Pradesh. Interpretation & conclusion: A better understanding of the distribution of antimalarial drug resistance with malaria parasite may provide insight into some of the epidemiological determinants of the increasing case burden. Background & objectives: Artemisinin isolated from Artemisia annua is the most potent antimalarial against chloroquine resistant Plasmodium falciparum malaria. We previously reported that the ethanolic leaf extract of Artemisia vulgaris, an invasive weed and the only Artemisia species in Sri Lanka, possess both potent and safe antimalarial activity (in terms of antiparasitic properties) in a P. berghei murine malaria model. We report here a prototype study that investigated antidisease activities of A. vulgaris ethanolic leaf extract (AVELE) in a P. berghei ANKA murine malaria model that elicit pathogenesis similar to falciparum malaria. Profound thrombocytosis and thrombocytopenia in mice were detected in early-stage (Day 3), and at a later stage of infection (Day 6), respectively. Plasmodium berghei infected mice, 7 or 8 days post-infection reached end-stage disease with rapid drop in body temperature and usually die within 24 h, as a consequence of cerebral malaria. Methods: Three doses of the AVELE (500, 750 and 1000 mg/kg) were used to assess antidisease activity of A. vulgaris in terms of survival, effects on thrombocyte related pathology and end-stage disease, antipyretic activity, and antinociception, using standard methodology. Results: The 1000 mg/kg dose of AVELE significantly increased survival, reversed the profound thrombocytopenia/ thrombocytosis (p ≤0.01), altered the end-stage disease (p ≤0.05), and manifested significant antipyretic and antinociceptive (p ≤0.05) activities. Interpretation & conclusion: We conclude that a crude ethanolic leaf extract of A. vulgaris, showed potent antimalarial properties, in terms of antidisease activities; antipyretic activity, peripheral and central antinociception, increased survival, averted end-stage disease and reversed thrombocytopenia/thrombocytosis. Background & objectives: Leishmaniasis is a major public health problem, and the alarming spread of parasite resistance underlines the importance of discovering new therapeutic products. The present study aims to investigate the in vitro antileishmanial activity and cytotoxicity of the ethanolic extract of Berberis vulgaris fruits and chloroform extract of Nigella sativa seeds against Leishmania tropica. Methods: In this study, antileishmanial activity of B. vulgaris and N. sativa extracts on promastigote and amastigote stages of L. tropica in comparison to meglumine antimoniate (MA) was evaluated, using MTT assay and macrophage model, respectively. MTT test was also used to assess the cytotoxicity of extracts on murine macrophages. The significance of differences was determined by analysis of variances (ANOVA) and student's t-test using SPSS software. Results: The results showed that ethanolic extract of B. vulgaris (IC50 4.83 μg/ml) and chloroform extract of N. sativa (IC50 7.83 μg/ml) significantly reduced the viability of promastigotes of L. tropica in comparison to MA (IC50 11.26 μg/ml). Furthermore, extracts of B. vulgaris (IC50 24.03 μg/ml) and N. sativa (IC50 30.21 μg/ml) significantly decreased the growth rate of amastigotes in each macrophage as compared with positive control (p <0.05). Our findings also revealed that extracts of B. vulgaris and N. sativa had no significant cytotoxicity against murine macrophages. Conclusion: The B. vulgaris and N. sativa extracts exhibited an effective leishmanicidal activity against L. tropica on in vitro model. Further, works are required to evaluate the exact effect of these extracts on Leishmania species using a clinical setting. Background & objectives: Aedes aegypti, Anopheles gambiae and Culex quinquefasciatus are vector mosquitoes of dengue, malaria, and filariasis, respectively. Since no vaccine is available to treat these diseases, the control of the main mosquito vectors is essential. As conventional insecticides have limited success, plants may be alternative larvicidal agents, since they contain a rich source of bioactive chemicals. The aim of this study was to evaluate the larvicidal activity of methanol crude extract, hexane, dichloromethane, acetone, ethyl acetate and methanol fractions of Spondias mombin leaf against IV instar larvae of dengue, malaria, and lymphatic filariasis vector mosquitoes. Methods: A total of 25, IV instar larvae of each target mosquito species were exposed to various concentrations (125-1000 ppm) and were assayed in the laboratory by using the protocol of WHO 2005; the LC50 values were determined by Probit analysis. Results: Hexane, dichloromethane and acetone fractions were the most effective against Ae. aegypti with LC50 values of 22.54, 42.13, 45.18 ppm, respectively. Hexane fraction registered the highest activity with LC50 of 92.20 ppm against An. gambiae. It was still hexane fraction that showed better toxicity with LC50 of 326.53 ppm against Cx. quinquefasciatus. Conclusion: The Spondias mombin leaf extracts proved to be a strong candidate for a natural, safe and stable mosquito larvicide to be used in population control of Ae. aegypti, An. gambiae and Cx. quinquefasciatus and so may replace the conventional Diclorvos to control malaria, dengue and filariasis in Nigeria. Background & objectives: ZCL is a growing threat in many rural areas of Iran which involves 17 out of 31 provinces. This study was conducted from April to November 2011 for evaluation of the efficacy of phostoxin and zinc phosphide against rodents. Methods: Rodent control operations were carried out using phostoxin and zinc phosphide. To evaluate the effect of rodent control operation on the main vector density, an entomological survey was carried out. The effects of the operation on the disease incidence were also evaluated. Results: After intervention, the reduction rate of rodent burrows was 32.68% in the village treated with phostoxin and 58.14% in the village treated with zinc phosphide. The number of rodent holes in the control area showed 6.66-fold increase at the end of the study. The incidence of the disease decreased to 19.23 and 11.40 in areas treated with phostoxin and zinc phosphide, respectively. A total of 4243 adult sandflies were collected and identified. The most common and dominant species was Phlebotomus papatasi. In the village treated with phostoxin, the density of P. papatasi in outdoors was lower than indoors. Nevertheless, the density of P. papatasi in the village treated with zinc phosphide was higher in outdoors. Interpretation & conclusion: It is concluded that phostoxin is less effective and has low safety in comparison with zinc phosphide, so that this rodenticide can be used only in special situations such as lack or ineffective rodenticides and only in the colonies far from human and animal dwelling places in small scales. Background & objectives: A longitudinal, entomological and virological study was conducted from 2007 to 2010 in four dengue fever affected areas of Thiruvananthapuram district, Kerala to understand the risk factors involved in the dengue transmission. Methods: Aedes surveys were carried out seasonally in the selected localities both indoors and peridomestic sites. Water holding containers were sampled for the presence of immature. Outdoor and indoor resting/landing mosquitoes were collected. Blood meal identification was performed by gel diffusion test and viral assay using the ELISA test. Results: The species found were Aedes (Stegomyia) aegypti (Linn. ), Ae. (Stegomyia) albopictus (Skuse) and Ae. (Stegomyia) vittatus (Bigot). Aedes aegypti and Ae. albopictus immature stages were also found during the study period. Aedes aegypti was the only prevalent species in the water-starved Vizhinjam, a rural coastal area with breteau index (BI) ranging from 40 to 271. Aedes albopictus was recorded in rest of the three surveyed localities-two urban and one rural ghat areas of Thiruvananthapuram district. Interpretation & conclusion: The vector control measures should be focused mainly on source reduction of water storage containers present in both outdoor (Ae. albopictus and Ae. vittatus) and indoor (Ae. aegypti). To achieve effective vector management, a public health response beyond routine larviciding or focal spraying is essential throughout the year. Background & objectives: In the absence of any commercially available dengue vaccine or antiviral therapy, controlling the primary mosquito vector, Aedes aegypti, is currently the only means to prevent dengue outbreaks. Ovitraps are being employed as a sensitive method for detecting the presence of Ae. aegypti. Size, colour, material, paddle and use of oviposition attractant have been reported as important factors influencing the efficacy of ovitraps. Methods: For the study of coloured ovitraps baited with grass infusion, 24 households were randomly selected in a locality and five ovitraps/premises were installed. Weekly ovitrap surveys were conducted during the study for four times. Ovitrap data were analyzed on the basis of its location, day-wise percent positivity, presence of eggs laid and inference of different ovitrap parameters were drawn. Results: Grass infusion, used in the ovitraps has highest attractiveness on Day 6 in comparison to other days. Percent positivity of different coloured ovitraps revealed that red coloured ovitraps have highest positivity (92.7%), followed by black and orange (91.7% each), green (76.3%) and transparent (45.8%). The individual colour-wise ovitrap positivity revealed that the highest ovitrap positivity on Day 1 was recorded for black colour (21.8%), which on D2 and D3, in case of red colour (37.5 and 26%). However, on D4, D5 and D6 highest number of positive ovitraps was recorded in orange coloured (12.5, 21.9 and 31.3%, respectively) and on D7 highest number of positive ovitraps were recorded in transparent (21.9%), followed by green coloured ovitrap (20.8%). The overall location-wise ovitraps positivity revealed that highest positivity was recorded among the ovitraps installed inside bathrooms (92.0%), followed by bedrooms (85.0%), lobby (66.7%) and stores (48.3%). Interpretation & conclusion: The study revealed that for immediate detection of the presence of gravid females in a particular locality during epidemics, the black coloured ovitraps may be useful, however, in normal situations for surveillance of the vector species, the orange coloured ovitraps might be more suitable. Bathrooms were found to be the highest positive location for pitching ovitraps. Background & objectivesi: Transovarial transmission of dengue virus in the Aedes vectors is now a well-documented phenomenon reported from many parts of the endemic areas in the world, which played an important role in initiating and maintaining the outbreak in human populations. This study investigated the factors affecting breeding habitats and the relationship with transovarial dengue virus in larvae of Aedes aegypti and Ae. albopictus. Methods: Larval surveillance was conducted in dengue outbreak areas in Malaysia from 2008 until 2009. Sampling was carried out based on habitat type, water condition (substrate type), canopy coverage, temperature and pH at breeding habitats. RT-PCR was performed to detect presence of transovarial dengue virus in larvae collected in the study areas. Results: A total of 789 breeding habitats were identified during this study and the majority of these breeding sites were plastic containers (57.46%). Aedes albopictus dominated most of the water condition surveyed, while Ae. aegypti indicated preference toward habitats with clear water. Aedes aegypti was selective in selecting ovipositional sites compared to Ae. albopictus where shaded areas were shown to be the most preferred. From a total of 363 mosquito larvae pools, 23 (6.3%) pools were positive for dengue virus where 18 of them were from Ae. albopictus and five were from Ae. aegypti mosquito larvae pools. Interpretation & conclusion: This study indicated the presence of transovarial transmission of dengue virus in immature Ae. aegypti and Ae. albopictus in the field. This study also showed that combination of water conditions, canopy coverage, temperature and pH of breeding habitats were the factors affecting the larval population. The study suggested that larval survey programme could serve as a tool not only to monitor the local dengue vector distribution but also to provide objective information for taking appropriate action by the community against dengue vectors. Background & objectives: Culex gelidus mosquito, an important vector of Japanese encephalitis virus, has shown to transmit West Nile virus (WNV), Kunjin and Murray Valley encephalitis viruses experimentally. An attempt was, therefore, made to study the replication kinetics and vector competence of an Indian strain of Cx. gelidus to WNV. Methods: Mosquitoes were infected by both intrathoracic inoculation and oral feeding and studied the growth kinetics by determining the virus titre on different days post-infection (PI). Vector competence was studied by determining the presence of WNV in saliva on subsequent days PI. Horizontal transmission was determined by demonstrating infection in infant mice by bite of mosquitoes that were fed on viraemic mice previously. Vertical transmission was studied by screening progeny derived from infected mosquitoes. Trans-stadial transmission was determined by screening adult mosquitoes emerged from parenterally inoculated IV instar larvae. Results: The mosquito replicated WNV to 7log10 TCID50/ml on Day 8 PI and maintained the titre for 14 days. Virus dissemination to legs and salivary glands could be detected, but not to ovaries up to Day 10 PI. The mosquitoes picked up infection from viraemic blood and transmitted successfully to infant mice on subsequent feeding. Trans-stadial transmission also could be demonstrated. However, vertical transmission could not be demonstrated. Interpretation & conclusion: The replication potential, maintenance of WNV for prolonged periods and ability to transmit WNV experimentally makes the mosquito a serious threat to public health especially in the wake of active WNV activity in certain parts of India.